ATLANTA, GA (January 23, 2019)- Benson Integrated Marketing Solutions, the multifamily industry’s first and largest centralized marketing platform (CMP), is proud to announce record-breaking advancement of the company’s “BGreen” commitment this past year, exceeding standard environmental guidelines greater than ever before. In addition to hosting the latest fleet of HP sustainable technology, the company reported increases up to five times on recycling, eliminated package volume, and fuel savings versus 2016. In 2018, the company recycled over 40,000 pounds of acrylic and aluminum, saved over 204,100 boxes through bundled shipping, and kept 246,000 pounds of paper and cardboard out of the landfill through recycling. The company continues their commitment to sustainable choices in 2019 and beyond. Benson integrates marketing solutions for the multifamily industry with innovative, environmentally responsible products, services, and operations. When partnering with Benson, clients have the added peace of mind and confidence that their marketing materials are exceeding standard environmental guidelines and practices. Adopting a mindset of continuous improvement, Benson has committed to sustainability by investing three million dollars in the most advanced green equipment, technology, and materials. The Benson way is founded on thinking, making, and delivering with sustainability in mind. Digital printing eliminates use of aluminum printing plates and developing chemicals. Digital technology reduces make-ready paper usage from an average of 300 sheets to one for every project. Reduces, captures and controls print emissions. Ink formulation reduces VOCs and ink usage. Reduced imaging oil consumption with on-press recycling system. Press parts and cartridges are recyclable and made of recycled materials. Water-based HP Latex inks are UL ECOLOGO®, UL GREENGUARD Gold Certified and meet AgBB criteria. They are non-flammable, non-combustible and nickel-free. Prints using HP-PVC-free wall paper, meeting AgBB criteria for health-related evaluation of VOC emissions of indoor building products. Can accommodate recycled and recyclable substrates. Regenerative braking: braking energy captured and directed to power other press components. An Economizer: using hot air to heat and cool air to required temperature. In 2018, over 40,000 pounds of acrylic and aluminum combined were recycled. LED lighting significantly reduces maintenance, energy use and heat emission without the use of toxic chemicals. Water-based latex inks meet stringent indoor air quality criteria. Digital printing utilizes concentrated inks with low emissions and less ink required per print. Wide range of paper and substrate options to meet FSC, SFI and recycled content requirements. Printing substrates used with Latex meet AgBB criteria. All waste paper is recycled facility-wide. Sign paints and coatings meet environmental regulatory standards and are VOC compliant. In 2018, the Benson Bundle program eliminated over 204,100 packages saving almost 25,000 gallons of fuel. In addition, this initiative eliminated approximately 177,300 pounds of packaging material from turning into landfill waste. Our shipping partner, UPS, has reduced the amount of fuel used for delivery to 0.12 gallons per package, reducing carbon emissions. All shipments are bundled together to save money and contribute to the environment. The facility does not supply any disposable paper and plastic drinkware to any associates, including cups, bottles, and straws. In 2018, the company recycled 123 tons of paper and cardboard, keeping 246,000 pounds of potential waste out of a landfill. Benson maintains and regularly evaluates a facility-wide sustainability program to reduce energy consumption, reduce use of materials, and recycle. 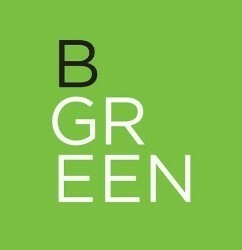 Look for the BGreen logo throughout our facility to see where we are thinking, making and delivering sustainable solutions for our clients.